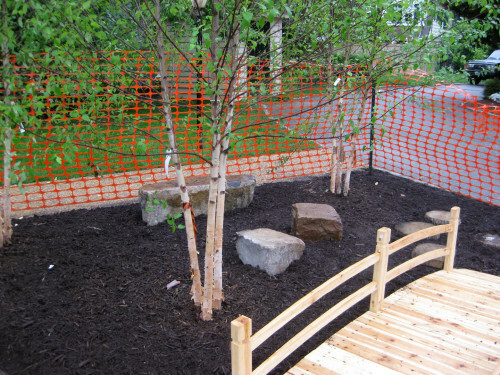 Creating the Outdoor Classroom was a collaborative venture. 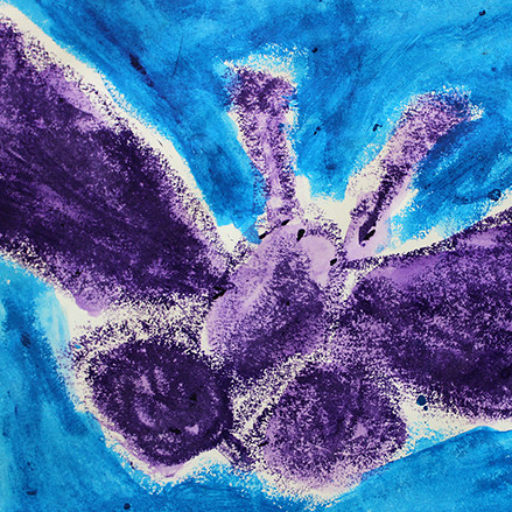 The seed had been rolling around in my imagination for years, fed by my observations of the way in which the children played outdoors and of the way they grow a relationship with nature. 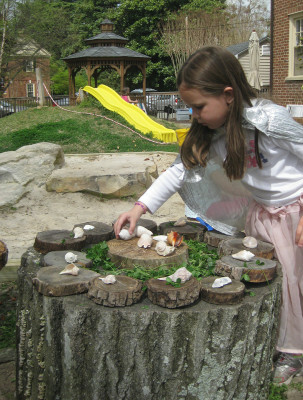 We’d tried some of the ideas in our tiny back yard…tree cookies turned into a stage and used for building; river rocks; sand; sheets, planks, hollow blocks and poles for making shelters; leaves and seed pods gleaned from walks around campus, and so on. 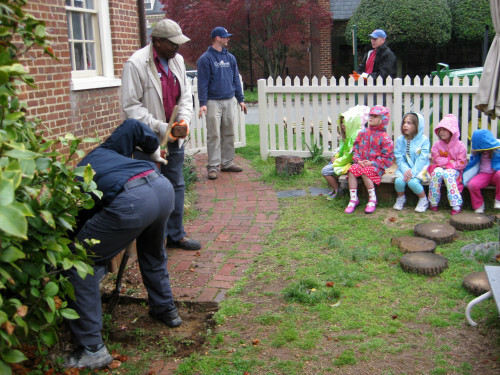 But now, with the demise of our across-the-street playground equipment and the need to create a new play space, that seed of an idea found soil, and it was time to let it germinate. It should be a collaborative venture, I thought. 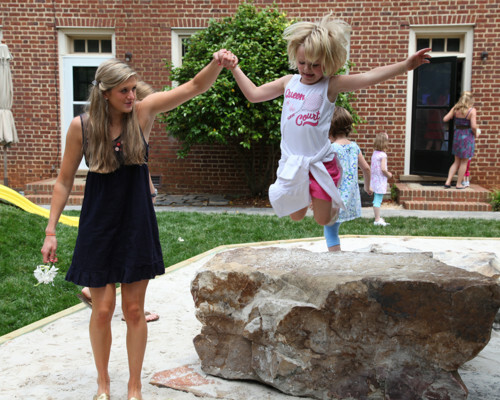 The children should have a voice in what this new play space would offer. So I invited them to think about it together. But it was September (the playground-wrecking storm came in August), and the children had been together only a few weeks. Their ideas were of amusement parks and manmade equipment, most likely what they’d known so far. I decided to take the question back to the children again later in the year, after they’d had some experience playing with natural materials and loose parts and their own imaginations. Meanwhile, I’d have to “hear” their ideas by making guesses about what might engage them, offering materials and experiences, and observing their responses. The plan grew. 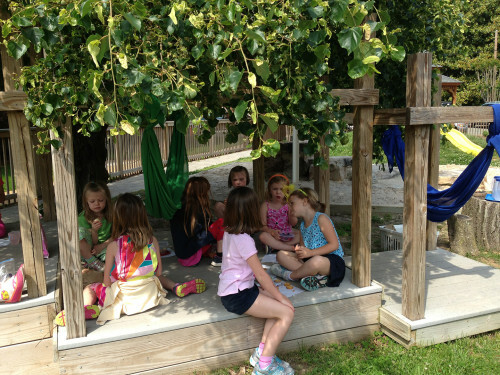 I wanted our Outdoor Classroom to be an extension of the indoor classroom, where children play and represent and hypothesize and construct and collaborate. I also wanted the space to represent where we are geographically. Richmond, Virginia has a river running through it, a rocky and wild class-IV rapids type of river. Richmond children who are lucky enough to go to the river rock-hop, wade, hunt frogs, collect rocks and shells, and watch osprey, eagles, and blue heron fish. And so we planned a river for our Outdoor Classroom, surrounded by boulders tall enough to climb. Richmond has seven famous hills. I wanted a hill in our space. We have trails that wind through forests, even within in the city park system. I wanted us to have a forest. And a tree house. A sensory garden. A fairy garden. 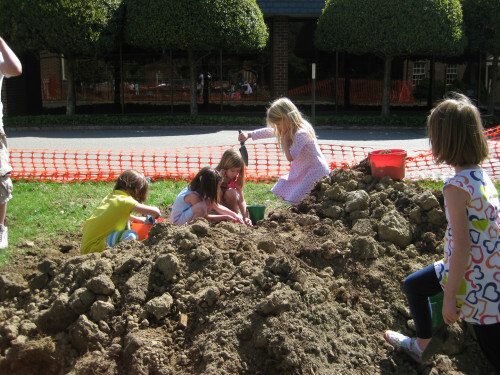 A place to dig in dirt and make mud and find bugs. An outdoor studio. I had a vision, but I had no idea how to put it together. 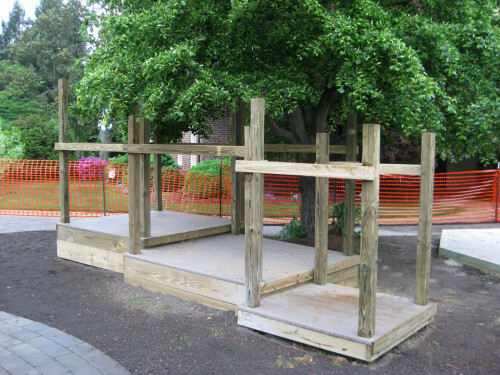 I sought the advice of a playground specialist who was working on another project at the school. 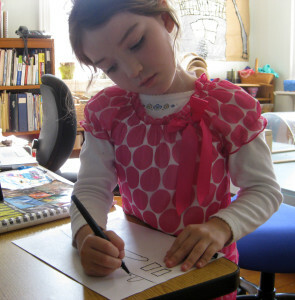 She sketched out a possible plan, which did inform our final blueprint. But she was in the manufactured element business, and I wanted this to be as natural a space as possible. I found another collaborator in the Coordinator of School Events, someone who has been at the school for a long time and knows more about the ins and outs of the politics and practicalities of the place than anyone else around. Carroll turned out to be a wonderful partner in this journey. Together we sought out boulders, found a contractor, shopped for a gazebo and a shed and pavers, and began the process of creating the bones of the Outdoor Classroom. Meanwhile, the children discovered the possibilities and joys of playing outdoors without static equipment, and with loose parts and gifts from nature. 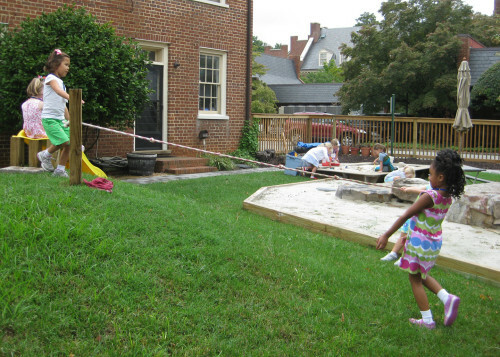 Their desires for the new play space shifted. We were intrigued by the fact that nearly every element suggested by the children when we asked again a few months later were already in the plan (all but the swing, and the children themselves figure out how to make that happen on their own, in different ways, just about every year since.). Here are the children’s suggestions. The children helped with demolition and construction where they could and watched when they could not. They were part of the process from beginning to end. 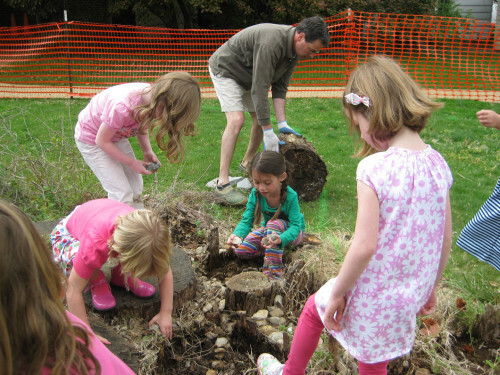 The children help deconstruct a stage made of tree cookies and river rocks, sorting out the rocks to use in play later. 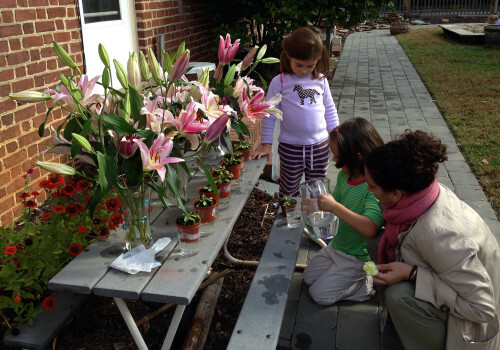 Over time, the children developed a deeper understanding of the process of creating the Outdoor Classroom. They began to offer ideas for the space. B, apparently having thought about it before coming to school one day, arrived in the morning and announced, “You know that Mr. McG (the contractor) told us we should have a bridge? I know how we can build it.” I invited B to draw her idea for Mr. McG. First she drew the parts he would need (at the bottom: the part you walk on [right] and the upright pieces of the railing [left)]). “Will he know how to put the parts together?” I asked. 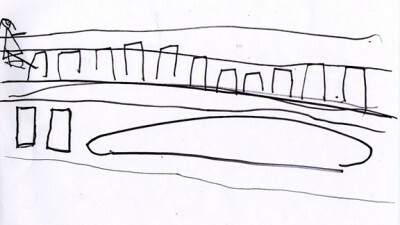 B responded by drawing herself going across the finished bridge (top) and later delivered the plan to Mr. McG, for him to work by. 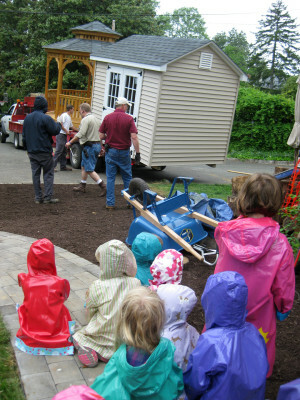 The children watch as the shed and the gazebo are delivered. 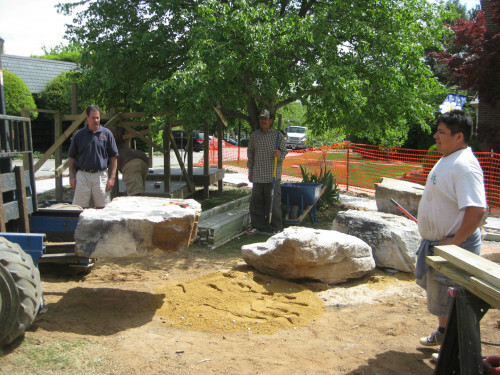 The boulders go into the big sand pit. The tree house is made of three platforms of varying heights. Though the tallest is just two feet high, the way the tree drapes over the structure makes the children feel as if they are high in the trees. 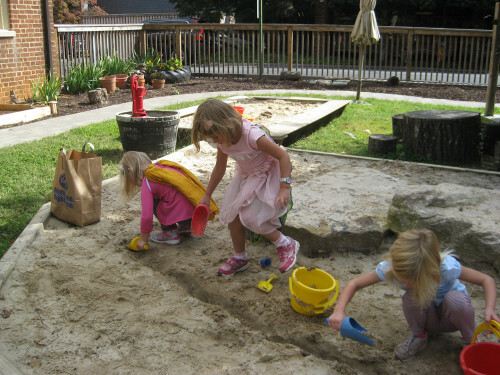 When the Outdoor Classroom was finished, the children suggested that we have a “Grand Opening.” They crafted an invitation for the celebration, with the idea that we invite everyone who worked on the project, the school administrators, and the “big girls who used to go to JK” (we settled on just the Seniors who used to go to JK, since all the alumnae of JK could not fit in the space!). 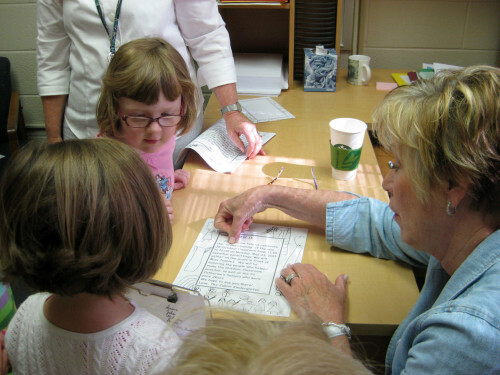 The children deliver their invitation to an administrator. Please come to our Grand Opening! 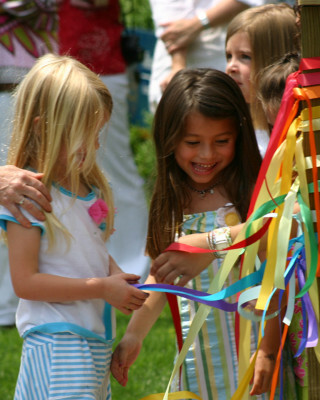 The Grand Opening included a ribbon cutting ceremony, with a ribbon for each child to cut. 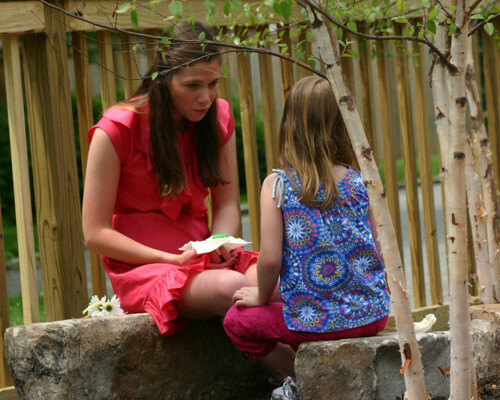 Throughout the process of creating the Outdoor Classroom, and in the years since, we have kept checking in with our goals and the children’s desires for the play space. The children wanted a pond; we wanted to offer water. 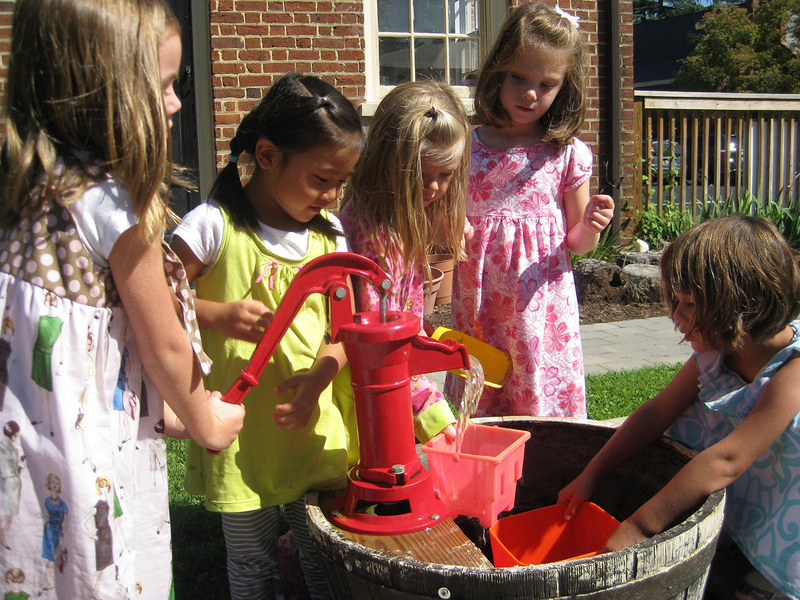 So we installed a pitcher pump…and the children have made rivers and ponds and seas in the sand pits ever since. They wanted “a little beach.” Two perpendicular sand enclosures serve that purpose, though we haven’t yet seen any sunbathers. They asked for a slide. We have one, installed into the hill. 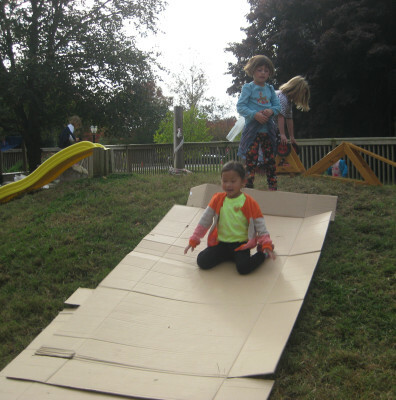 But the children also make their own slides, from planks, cardboard, and any other loose part that can be made to incline and allows them to slide. 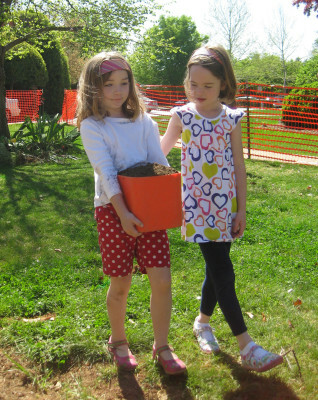 It has been interesting to see how it has been not only the children’s relationship with nature that has been fostered by their outdoor play in the Outdoor Classroom, but also their sense of agency. 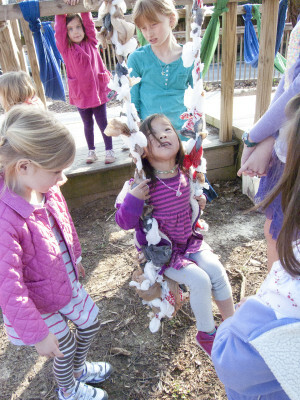 The children and teachers have learned that, with the right skeleton and some loose parts, whatever the children imagine can be created in their Outdoor Classroom. 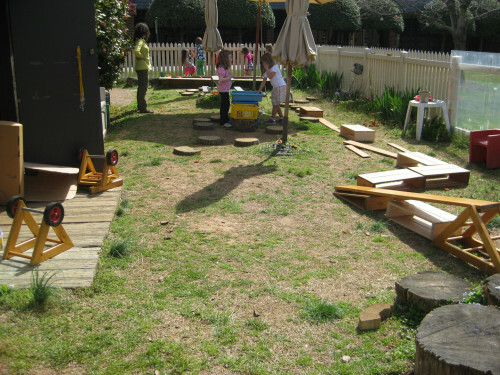 In the next few posts will I’ll share some stories from the Outdoor Classroom from the three years since its creation.